As the sun sets on the best week of the year so far (weather wise) it’s a small reminder that when it’s nice and sunny outside this is the best country in the world! So with that in mind, let’s crack on with this weeks Dublin Gig Guide! A couple of very special shows throughout the week, covering pop, metal, blues and a gig for the fantastic charity Aware! Anyway without further ado, let’s crack on! Monday night sees The Vamps take the stage at the 3 Arena, the young English four-piece began out recording covers on YouTube which gave them an online following they began being compared to One Direction. With support slots for bands like McFly, Demi Lovato, The Wanted and JLS. They are due to release their third album later this year! Also on Monday night over in The Academy (moved from the Olympia) we have Tom Chaplin, possibly better known as lead singer of pop/rock band Keane. Chaplin released his debut solo album in October 2016, this tour is in promotion of that and includes shows in USA, Canada and all across Europe, with tickets at €34.50 a piece. Tuesday night is a big one for any fans of the heavier side of rock, because in Vicar Street we have Deftones performing! The first of a two night run in Vicar Street, known for their heavy, de-tuned guitars, and crushing drums Deftones are one of those bands you have to see before you die. Their latest album ‘Gore’ was released in April of last year and was voted number 40 in the Top 50 Albums of 2016 by Consequence of Sound. It’s a rarity that Dublin occurs such high-end metal talent so Deftones is definitely one gig you don’t want to miss! Over in Whelan’s, we have Cherry Glazerr, an American garage-rock band touring who are touring off the back of their most recent album release titled ‘Apocalipstick’. Some very catchy songs under their belts along with sounding like a mix of early Pixies and The Strokes for €15? No brainer! Wednesday night we have singer songwriter Dan Owens playing at the Grand Social. Dan has a voice that sounds like he’s been around for a long time, he has developed his sound through support from legendary Fleetwood Mac Drummer Mick Fleetwood, who helped him secure a deal with major label Atlantic Records – not bad for the 23 year old from Shrewsbury! In the Button Factory we have a very important gig, Aware Ireland are a charity that helps people cope with stress, depression, bi-polar and mood disorders and help people work through the stigma of mental-health and provide support for sufferers. This gig is to promote “Degrees of Light” Charity Album that the second-year diploma and Live Sound classes here at STC having been working on for the past few months. So much time, effort and work has gone into all aspects of this project, including raising awareness through fundraising and busking. On the night, we will have live performances from some of the best new and up-and-coming Irish music acts, including, Farah Elle, Craig Gallagher, Josh Gray, Wolves of Youth, Moon Looks On, BARQ, and The Shruggs. It is going to be a great night for a great cause so if you’re are about be sure to make it down! Entry is free and you can make a donation to Aware on the night! Thursday night we have Bob Dylan making his return to Ireland with a headline show at the 3 Arena. Dylan is not known for his live performances often opting to perform his newer music in favour of his older, more popular tracks. Nonetheless, he is a legend and should be treated like one! As you would expect, tickets for this one are sold out! He released his 38th album in March of this year titled “Triplicate” and consists of 3-Disc compilation of classic cover songs. While Bob will be rocking the 3 Arena, Mutefish will be performing alongside Punch Face Champions and The Scratch in Fibber Magee’s on Parnell St. Mutefish are throwing this show themselves before they head off on tour for the Summer, so they’ve enlisted the help of two other great Irish bands and all for just €5! A perfect way to start off the weekend! Kicking off Friday night we have Billy Ocean playing in Vicar Street the 70’s singer had a number of hits throughout the years including “When The Going Get’s Tough” & “Love Really Hurts Without You”. Tickets are still available at €48! Over in Whelan’s on Friday night we have a special gig organised by the great who are behind Knockanstockan, as it takes a break from the festival scene this year. Acts performing on the night are Mescalito, Farah Elle, New Secret Weapon plus many more. Tickets on the door are priced at €12. We also have Daft as Punk playing at the Grand Social for all the Daft Punk fans, and over in Swords we have Sigala performing his usual popular EDM in the Wright Venue. On Saturday evening Techno takes over Dublin as Perc brings his twisted, dark and unruly brand of Techno to Index, w new nightclub offering up the worlds best electronic artists. while over in Opium rooms from 11PM we have Ellen Allien performing in Dublin for the first time in a number of years. A busy night over in the Opium Rooms, as earlier on in the night one of the hottest bands at the moment are playing, (no pun intended 😉 ) The Hot Sprockets after releasing their new single “Soul Brother” along with a video for the track and this gig! Be sure to head down for a good night. Closing out the weekend we have Swedish masters of Misery Katatonia are playing The Academy as part of their latest album The Fall Of Hearts which was released on the 17th March this year. Dublin will be the final gig of their UK & Ireland tour so it’s going to be a good one! Finally, over in Whelan’s Tom Walker is playing the upstairs venue in promotion of his new EP which was released in March and was produced by Jim Abbiss who has worked with the likes of Arctic Monkeys and Adele. 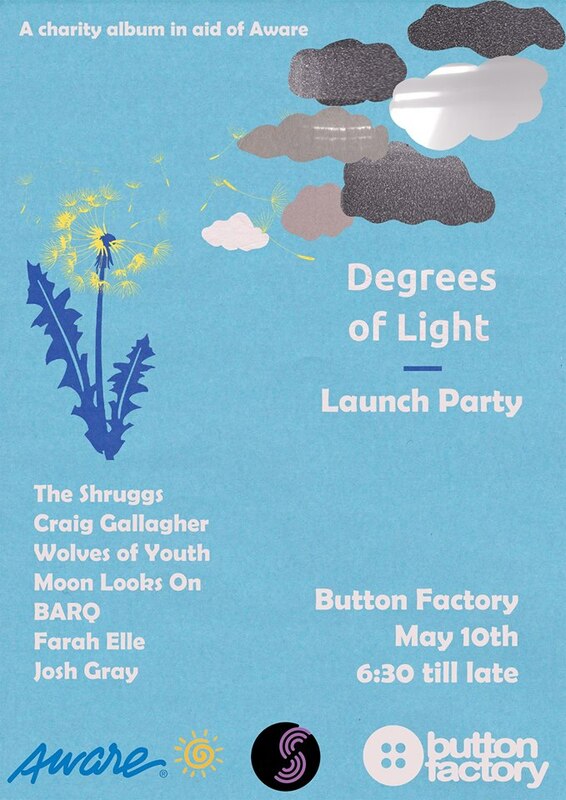 As always it’s time for our GIG OF THE WEEK and there can only be one winner and of course it has to be the Degrees of Light launch in the Button Factory. Aware Ireland is the top support network for people suffering mental health issues and this album release and gig are to help raise awareness about mental health in our society. We need to remove the stigma behind mental health issues and let people know that its OK not to feel OK and places like Aware are there for when you are feeling that way. So why not come down and support the charity by donating what you can and receiving some top quality Irish Music for a great cause.